Study Tip for the Final Exam 1. Prof. White gives very important Study Tips for the Final Exam in the video “Preparing for the Comprehensive Final Exam”. In addition to that a special training exam has been prepared. You can find it in the Quizzes and Exams. It is called Final Exam Preparation Example Clinical Case Quiz. This is ungraded exam and allows you to practice for the Final Exam. Study Tip for the Final Exam 2. Again use past material to review. If you go to the list of Video Tutorials on the course website, you find two files subtitles (txt) and subtitles (srt) with every tutorial. You can use the .txt files from the tutorials that contain information on the concept you want to review to decide which of the tutorials you want to watch again. The subtitles (srt) refers also to the timeslot in the tutorial where the text is spoken. That allows you to go back to a specific time in a tutorial and review the visual material that is presented on a certain neuromedical concept. Study Tip for the Final Exam 3. Part 1 (2 cases, 13 questions). Part 2 (2 cases, 7 questions). Part 3 (2 cases, 11 questions). Part 4 (2 cases, 12 questions). Study Tip for the Final Exam 4. Genes to Cognition. This an extremely useful site; if you go to the 3-D brain you can look at separate brain structures. Not only that, case studies, associated functions, associated cognitive disorders, and associated with damage give a wealth of useful information. Make good use of this. Study Tip for the Final Exam 5. On the Virtual Lab, Unit 5: Cognition you can find another useful resource: Regions and functions in the cerebral cortex, a list of functions and deficits or problems revealed when injury occurs at particular locations, by Centre for Neuro Skills. Study Tip for the Final Exam 6. 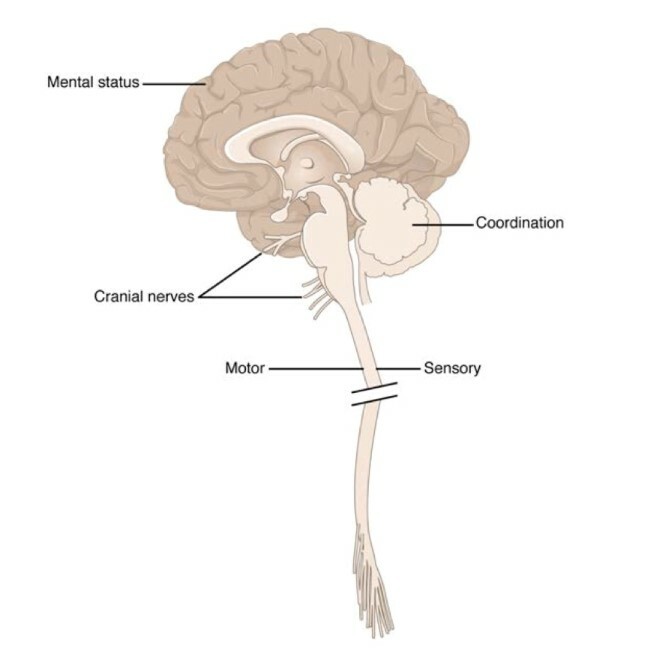 Reminder, in Study Tips Sensory Systems this tip can be found: There is a place in the brainstem where damage can lead to dissociated sensory loss in sensations to the face. In medical neuroscience it is important to be able attribute this dissociated sensory loss to the structures in the medulla. It could be very useful to re-watch tutorial Pain and Temperature Pathways (part 2) from 15.00 to the end of the tutorial. Study Tip for the Final Exam 7. On the Virtual lab this link can be found MRI images: MRI – Frontal, Axial and Sagittal MRI images . Study Tip for the Final Exam 8. At the page Neurological Exam there are very useful resources in the paragraphs: Neurological Exam, NeuroLogical Cases and Clinical Neurology Videos. Use them well to prepare for the final exam. Study Tip for the Final Exam 9. Left and right in axial images. Because most of the images are quite symmetrical, as is the entire human body, it is obviously important to know where is left and right side of the actual patient. Especially so for Clinical Cases and the exams, where you’ll need to relate presented symptoms to anomalities on an image. Brainstem and spinal cord slices as demonstrated in Sylvius, and the tutorial notes are presented in axial view. The point of view is from below. It is like we are looking to the persons top of the head through his or her feet. It is the same as for Magnetic Resonance Images as for photographs and drawings. Photographic images or drawings: with the anterior side below and the posterior side above. It is like the person is lying on his/her belly, face downward. What you see on the left side is at the left side of the body. MRI images: with the anterior side above and the posterior side below. It is like the person is lying on his/her back. What you see on the left side is at the right side of the body and vice versa.